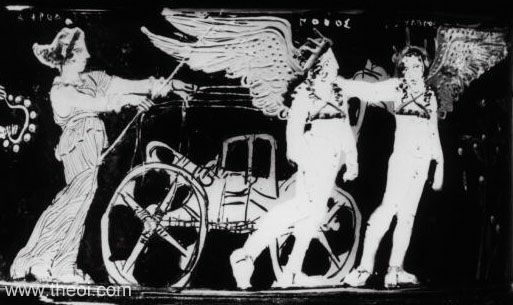 Band: Aphrodite drives a chariot drawn by a pair of Erotes (winged love-gods)--Pothos (Sexual-Longing) and Hedylogos (Sweet-Talk). The goddess is surrounded by several other divine attendants (not shown)--Eros, Harmonia, Eunomia, Eudaimonia, and Paidia. Lid: Dionysus and his retinue (not shown).